Hope you all had good week end. Mine went well. I was little bit busy. Hence I was not able to prepare and shoot any of the recipes that I cooked last weekend. I have few recipes in drafts and I will be posting them hereafter when I don't get time to shoot new recipes. I want to post this citrus flavoured cake in my blog for a long time and now I am finally doing it. I have adapted this cake from US Masala. Thanks to Puja for the wonderful cake. It came out super soft and moist. 1) Preheat the oven to 375F(190.5C) for 15 minutes. Grease the loaf tin (I used 2lb, 25CM X 12CM) pan with butter/spray. Dust it with flour. Keep it aside. 2) In a mixing bowl, mix all the dry ingredients. Keep it aside. 3) In another mixing bowl, add egg and sugar. 4) Beat well for 2 minutes. Add oil, yogurt and continue beating. 5) Add orange zest . Mix well. 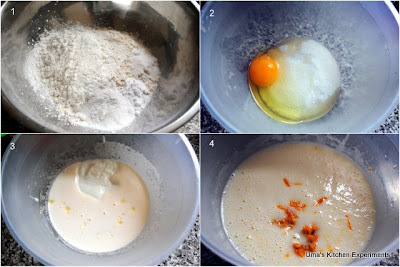 6) Mix the wet ingredients with the dry ingredients and mix it well. 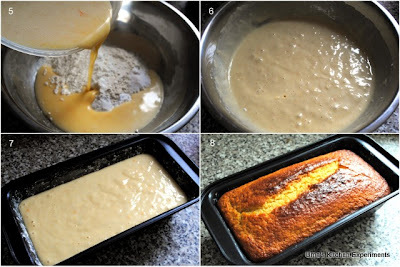 7) Pour the batter into the prepared pan and bake it for 35-40 minutes at 375F(190.5C) or until the toothpick which was inserted into the cake can be pulled out neat & clean. 8) Allow it to cool down for 10 minutes. Transfer it to wiring rock. Cut it into slices and enjoy the cake. Such a super moist cake, love citrus flavoured bakes anytime. woah! drool drool! what a lovely cake! Yummy - it looks so perfectly done! Hi Uma, happy to see the came came out so well. Thanks for the reference. Will appreciate if you also add a link back. Here is the original link. perfectly baked.. like its color..
Wow perfect orange cake loaf...! !